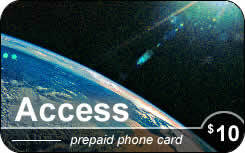 We offer a great selection of cheap international phone cards for international and domestic long distance phone calls. Using our prepaid phone cards you can make cheap long distance, international and overseas phone calls to destinations around the globe. Cards provide low calling rates. International Cellular Phones Typically, calls to international cellular phones are billed at a different calling rate per minute than to a landline. Please verify all international calling rates before making your purchase.